Dentsply Sirona, The Dental Solutions Company™, is one of the world’s largest manufacturers of professional dental products and technologies, empowering dental professionals to provide better, safer and faster dental care with a 130-year history of innovation and service to the dental industry and patients worldwide. 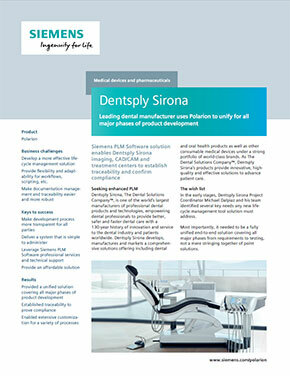 Dentsply Sirona develops, manufactures and markets a comprehensive solutions offering including dental developmentand oral health products as well as other consumable medical devices under a strong portfolio of world-class brands. As The Dental Solutions Company™, Dentsply Sirona’s products provide innovative, high-quality and effective solutions to advance patient care.